This week we talk about different kind of book. 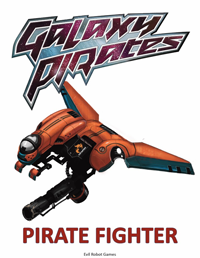 Galaxy Pirates Starships Pirate Fighter is a 4 page PDF for Starfinder. I spent $0 at $10 an hour for very little Layout work I did myself to setup the PDF and an InDesign template for Starships. I spent $0 at $0.05 cents per word on writing to get the PDF ready. I wrote everything myself in under an hour, maybe two or so. A lot of this was thanks to an Excel spreadsheet I created that makes creating starships easier. I spent $4 on 3 pieces of stock art for this and two other books that haven’t been written yet. Publishing advice from the early 2000s will tell you that you need one piece of art per 4 pages and you should spend about $25 per piece of artwork. So going with $4 stock art I came in well below the regular budget baseline. The Galaxy Pirates logo from the before is being reused, the template Jim made for the Voidborn book and gradually changed into the Starship template made writing this book easier. I see lots of ships on OBS for Traveller going for $4 each, but I am sticking with our $0.99 pricing for ships that are just cover art and stat blocks. Subtotal for the book is $4 actual money spent, and really only used $1.33 worth of the stock art, the rest is all speculative writing/design labor on my part. Will we ever make that back? Since its release until the time of this writing, Galaxy Pirates Starships Pirate Fighter has sold 10 copies, @ $0.99 of which I should make 65%, I’ve actually made $6.11 off the book. So I am either $2 or $4 ahead on this book depending on whether or not I use the other two ships in the stock art pack for other books. One can assume this book will sell better when I complete the second dozen starships in the line and it goes into another Dozen starships bundle. I’ve written 5 stock art based starships so far and all of them have sold at least 8 copies generally making back their initial stock art investments. On the actual game design side of the house all of the stock art starships were part of a new design idea to release a starship as the standard model with 4 or 5 more stat blocks designed as themed variations of the original similar to applying Templates to Monsters in Pathfinder. This gave us Heavily Armored starships, Advanced fighters, Ace Custom Fighters, Degenerate knock-off models, Science and Research vessels, Medical Transports and more from just a few base models.